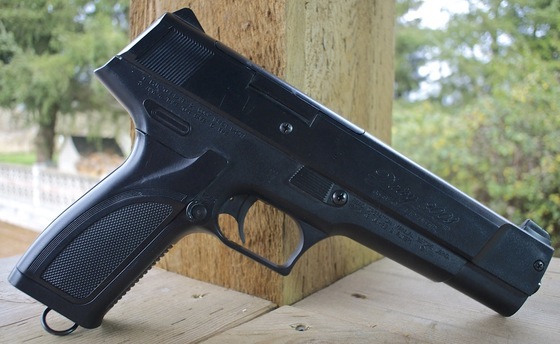 Checkout my Table Top Review for the Daisy Power Line 2003 Blowback Pellet Pistol. It's that time of the year again where I dread having to go outside and do my Field Test Shooting Reviews, it's way too cold so the CO2 guns are not performing at their very best, neither am I since all I'm thinking about is "let's get this over so I can go inside and warm up with a nice cup of coffee ;)". It's also dark and dreary which means the lighting is not so good for the cameras or the chronograph, even with a bunch of extra lights setup, it's just not the same as what a nice bright day can do to spruce up the video and get the chrony to read the pellet speeds. After some playing around with the lighting, I did manage to get my Chronograph to read a couple of shots and it shot just a bit above 350 fps, I would imagine the Daisy Power Line 2003 Blowback Pellet Pistol should get 400" fps easy on a warm day with a fresh CO2. At least we have an idea of whereabouts it shoots. Once I finished playing around with my temperamental chronograph, I headed back to the 30 foot mark and took aim at my paper target using a semi rested position (sand bag rest up front, standing in the back). I shot the rest of the magazine, which was around 10 rounds left since I was originally loaded up with 30 rounds and ended up using a lot of them trying to get my Chronograph to read for the first part of the field shooting test. Even with the fairly wide open sights, I managed to get a very consistent 1.5 inch grouping out my Daisy Power Line 2003 Blowback Pellet Pistol which kind of surprised me since I did not really feel the sight picture was suited for accuracy. Too much open space side to side but none the less it shoot straight and true and even very well centered on target with only a bit of pull to the left. In terms of shoot-ability, the Daisy Power Line 2003 Blowback Pellet Pistol felt pretty good, the trigger is not the lightest for a single action only trigger but it is short and the break is clean. I had no miss-feeds or jams which I have heard this gun is prone to with some pellets. I did notice when shooting rapid fire without any pellets in the gun, it wanted to go into short full auto bursts, this may have been the cold weather and/or low CO2 playing into things. All-in-all the Daisy Power Line 2003 Blowback Pellet Pistol is a nice air pistol to shoot even though it is a bit unorthodox looking, kind of a shame it's no longer in production. If you can find one in good working condition at the right price, pick it up because you may not get another chance.